The KLM Sea Safari 6 Liveaboard has 10 air-conditioned cabins, each with en-suite bathrooms. Built over 4 decks to offer space and comfort, the KLM Sea Safari VI Liveaboard leaves plenty of room for relaxation. The KLM Sea Safari 6 has an air-conditioned restaurant and lounge area, with 32” LCD TV and DVD player and a stunning outside bar area where you can watch the beautiful sunsets or talk beneath the stars. There is also a relaxing sun deck area to chill out in between dives. The spacious diving station allows plenty of room for gear storage and there are separate rinse tanks for dive equipment and underwater cameras, as well as a dedicated camera table. As will all the Sea Safari Fleet, their vessels are equipped with modern navigation systems and up to date first aid and safety equipment. 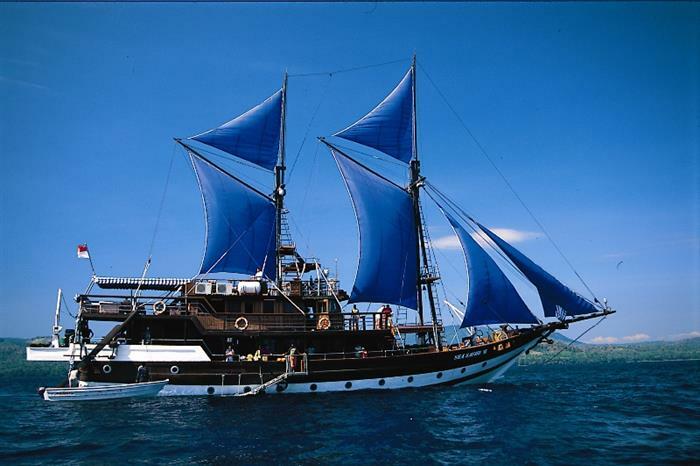 Start your Indonesian scuba diving liveaboard adventure and reserve your place today.